Are you a beginner banjo player? Are you thinking about learning to play this amazing instrument? Here is our hand-picked selection of beginner banjos, priced for the beginner banjo player that are on sale. Learning to play the banjo is rewarding and something you can enjoy at any point in life. We sell plenty of resources to help you get started; everything from DVDs, books, and training aids. Since 2003, banjo.com has sold banjos to beginner banjo players all of the world. We welcome questions if you aren’t sure which beginner banjo is best for you. Use our contact form or call 678-488-BANJO. The Goodtime Banjo Beginner Package includes a Goodtime banjo, a Deering gig bag, banjo strap, picks, tuner, and a beginner DVD. This package includes everything needed to successfully get started playing the banjo! 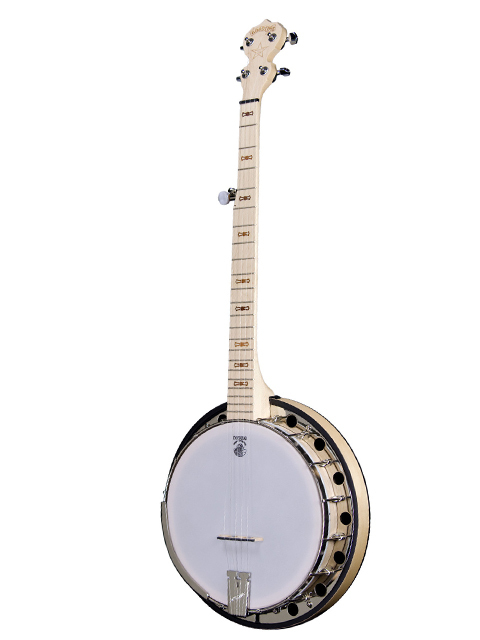 Including the perfect light weight (4 lb) Goodtime banjo that you can take with you when you travel. Learn to play old time Appalachian banjo. Featuring the brand new Goodtime Americana banjo, you’ll learn to play old time tunes in the clawhammer style. The Deering Goodtime Americana is the first 5-string banjo from Deering to be fitted with their new Grand 12" rim, giving this banjo a stronger bass response and warmer tone. The fullness and warmth of the larger rim is further enhanced by the addition of a 12" Renaissance banjo head which beautifully complements the instrument both visually and sonically.